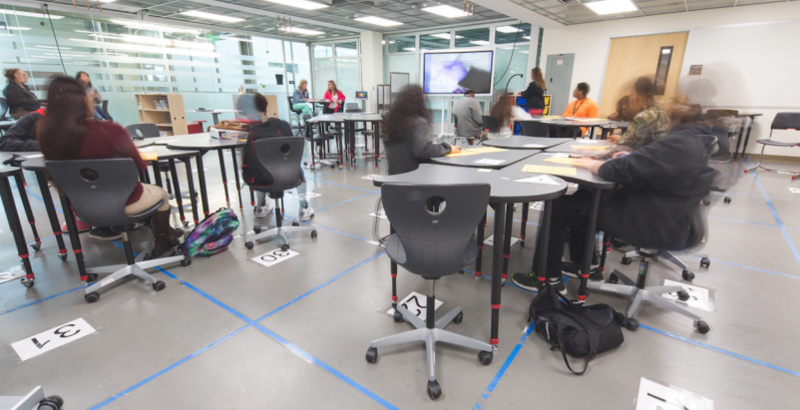 At a prototype classroom on the campus of Baylor University, in Waco, Texas, school officials and teachers experiment with new types of furniture, workgroup configurations, projectors, writing boards, and mobile technology to test new teaching methods and classroom layouts. Opened in 2015, the Learning Experience Laboratories (LEx Labs), created by design firm Huckabee, a local educational service center, and Baylor, is a microcosm reflecting nationwide trends. The lab is a kind of flight simulator where educators experiment in ways that address forces in the corporate world and trends in technology influencing K-12 education. New styles of working—more collaborative and project-based—and mobile technology are changing how people work. The K-12 education sector is responding to those trends. The need to revamp schools to keep up with the times adds urgency to planning and funding decisions. K-12 construction put in place declined to $12.9 billion in 2015, from $14 billion in 2014, according to School Planning & Management, so school districts have had to upgrade their physical plants with fewer resources. The impact on design of mobile computing devices, movable furniture, team teaching styles, and more collaborative project work means most architects are creating classrooms far different from the ones in which they were educated. When a radical concept arises it helps to visualize what the alternatives could be in a mock environment like LEx Labs. Design firms must also help educate parents and taxpayers about new learning spaces. Building support for new projects is more important than ever, says Roger Smith, AIA, LEED AP, Principal, BBS Architects & Engineers. “Parents know a lot about their kids’ education. Their expectations are bigger, and they’re more involved,” Smith says. To generate funding support for major new projects, school districts often mix in amenities that can be used by the whole community. These features include old standbys such as athletic fields, gymnasiums, and auditoriums, but with new twists. KSS Architects designed a combination facility that is best described as an auditorium with a gym built into it for Gottesman RTW Academy, a private school in northern New Jersey. “They wanted the space to look like an auditorium, not like a gym,” says Merilee Meacock, AIA, LEED AP, Partner, KSS Architects. “A higher-end aesthetic was important. They wanted to display their identity such that performance was a higher priority than athletics.” An accent wall/proscenium/cloud ceiling creates a room-within-a-room effect. Resilient and durable materials ensured that the space would hold up to gym use. The Jewish day school uses the space for high-holiday services, so the room had to look the part. This adaption helped generate financial support for the newly constructed school. KSS’s design also had a strong narrative based on a Hebrew phrase meaning “heal the earth” to relate to stakeholders. The building was integrated within the natural contours of the hilly, wooded site. Retaining walls were built with rock blasted from the site during construction. A garden and greenhouse provide for site-grown food. Students help tend to the gardens and sometimes help cook what they’ve grown. “They can see the life cycle of growing and cooking food,” Meacock says. The ecological angle was “a narrative people could visualize and understand,” Meacock says. Space flexibility is critical to classroom design. Spaces have to be adaptable, even allowing for drastic changes such as, say, a doubling of classroom size. Meacock recommends that walls separating classrooms should not be load bearing. Shared spaces must also be able to accommodate multiple uses. The tables in the dining hall at the Gottesman school can be removed so that the space can be used for science lab projects. More than ever, designers must consider the furnishings during the earliest stages of a project. “If every kid has a tablet, where will we put the tablet cart?” asks Kevin J. Walsh, AIA, LEED AP, BBS’s Lead Designer. Spaces that allow for multiple furnishing configurations will be most adaptable. K-12 design and construction firm leaders know they must keep close tabs on trends in primary and secondary education during this time of great flux. Who can predict with 100% accuracy how new generations of technology will influence teaching and learning? Where there is uncertainty over pedagogy, there must be a proportional amount of flexibility built into the design. Firms that connect best with educators tapped into influential trends will have a distinct advantage in this market.